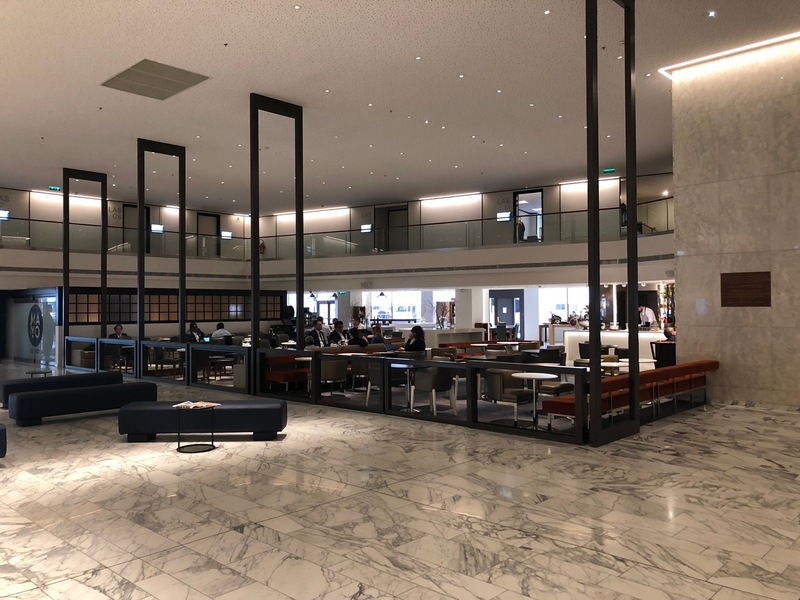 I would have been happy to stay another night at the Park Hyatt Paris, but no vacancy forced me to move over to the Hyatt Regency Paris Étoile across town. This 995-room hotel was transformed over the last two years and now features newly-remodeled guest rooms and a much fresher appearance. Don’t ask how much I paid for this place. Well, I’ll tell you. It was nearly $400. That’s simply not worthwhile, but on a busy weekday when the majority of hotels were sold out in Paris, I had to take what I could get. In case you are wondering, no base rooms, therefore no points space was available. The hotel is a Category 4, so generally a room will run 15,000 points per night or 7,500 points + $100. I was checked in by a very gracious attendant who welcomed me to the hotel explained that my room would have a view of the Eiffel Tower. She forgot to code in access to the Regency Club into my key card, but thankfully remembered when I asked about breakfast hours. I was also handed a letter inviting me to a complimentary cocktail at the lobby bar. The hotel is shaped like an oval with 32 rooms on each floor. Rather than pressing your room number inside the elevator, you enter your floor number outside the elevator bank via an electronic keypad and are then assigned an elevator. My room, 2615, was quite small, but had an amazing view of the Eiffel Tower. The room had that “new car” smell. A small couch, desk/table, and kind bed took up most of the real estate in the room. Wisely, the room offered several plugs (no adaptors required) and USB ports. The bathroom was also tiny, with a walk-in shower and no bathtub. I stopped by the Regency Club about 7:45p, just as the evening happy hour was winding down. The spread was certainly not enough for a full meal, but nevertheless quite tasty for pre-dinner snacks. I appreciated the proactive service of the lounge attendants, who promptly offered me a choice of beverage. Breakfast for Globalist members is only available in the Regency Club, not in the hotel restaurant. The selection was very good, I thought, for a lounge. Furthermore, the quality of the food was also excellent. I enjoyed fresh-pressed juices, scrambled eggs, and berries. The fitness center feels like it is in a converted conference room. It stretches over three different rooms, actually, and has an excellent selection of equipment. No pool, spa, sauna, or steam room at this property. The “Lobby Restaurant” is open from 6:30a to 11p each day and serves as the hotel’s main restaurant. I sat down here for a few minutes to speak to my wife and redeem my check-in cocktail voucher. While the bartender made a noble attempt at a Mai Tai, I should have opted for something more French. The Panoramic Bar, located on the 34th floor, was closed during my visit. The newly-renovated rooms are very comfortable and the views amazing from the upper floors. I also enjoyed the Regency Club breakfast spread. Even so, I felt shafted by paying so much for this hotel. You can criticize me for being so loyal to Hyatt, but the Hilton (my back-up hotel chain) was even more expensive and all Marriott/SPG properties (third choice) were sold out. In any case, I recommend this hotel, especially if you can use points during a busy period in which rooms run in excess of 200EUR. 3) Attached shopping center below, including small grocery store and Angelina location. Ha ha, George V, mentioned in the above reply. Would have been even more expensive. I wonder what view the other side has? A north view? Or maybe northwest so skyscrapers at la Défense? If no base rooms were available, what category room did you end up with? You mentioned that your room was quite small – curious as the the category. The small rooms (and the renovation) is what has kept me from staying there. Nice to know about the Lounge being the only option for Globalist breakfast there. Spread looks pretty good, except for those ultra-watery “scrambled” eggs. @ Matthew — I hardly think $400 is worth getting angry about. For what you received, that doesn’t seem outrageous for Paris. Agree $400 is too much but it’s springtime in Paris, so hardly surprising. In any case, whenever there’s a major event at the adjacent Congress Centre the rates skyrocket. Generally better rates are at weekends and lower seasons when it can be had for as little as €150. I preferred the lounge before renovation: it was very 1970s unfashionable but rather quirky. I’m sure most prefer the updated one. That’s certainly a $400 view! Almost looks fake it’s so perfect. ‘I Got Shafted…’ I thought this was a PG site…. @Matthew anywhere you can get a view of the Eiffel Tower is amazing, but the Westin Paris Vendome offered the closest and best views of the Eiffel Tower! Thanks so much for this review! Going next month with a large group of friends for the Ryder Cup and staying there. Any great restaurant recs near the hotel? Thank you!! Unfortunately, the hotel is not close to any nice restaurants. There is a mall within walking distance, but I just ate at the hotel. Thanks for your reply. One more question – we are only staying at the Hyatt because it’s apparently the place people are staying for the Ryder Cup and transportation is provided for us. Any idea how to access the Regency club you mentioned if we aren’t Globalist members? Happy to pay extra. Thx! Thank you for the great info, I am booked there in November, can anyone give any info. on the weather. Do I need heavy winter gear or light jackets & sweaters?